ARE YOU HAVING A COMET PARTY? THE BURKE CASE III: WHO HID THE KEY WITNESS? No doubt about it, Fred J. Wiseman was Santa Rosa's homegrown Elvis in 1910. Consider this measurement of fame: Wiseman and his airplane appeared at the racetrack that year but he didn't fly - the winds were bad that day. In a motorcycle race also at the event, a guy set the world speed record but in the Press Democrat, the record-setting got a distant second billing to the introduction of Wiseman and his team to the crowd. The Rose Carnival that year was to be the first opportunity for the public to see the Wiseman airplane - and likely the first chance for locals to see any airplane at all. It was only a couple of years since the Wright Brothers had become household names and planes of any sort were rare birds indeed, particularly on the West Coast; the first flying exhibitions came to California earlier in 1910, and at the San Francisco show only a single pilot actually flew. Not a week passed without newspapers featuring aviation stories on their front pages, telling of new records set for distance or speed or of terrible accidents. Both Santa Rosa papers avidly covered that sort of news, with added breathless coverage of Wiseman's efforts to design and build an aircraft in a Windsor pasture. All this (and more!) was covered in the intro, "Fred J. Wiseman, Hometown Bird-Man." A week before the aircraft was put on display, the Press Democrat began beating the drums to build excitement. During Rose Carnival weekend it was to be seen in the empty lot at Fourth Street and Mendocino Avenue (current location of the Rosenberg building, which was constructed in 1922). No detail was too small; there were articles about workmen clearing away junk scattered on the lot, building a tent, that it took "three big wagons to haul the airship to town in its many sections" and that there would be a small admission price to view the machine up close, with school kids getting a free peek. The paper assigned Tom Gregory, the best writer in town, to take a spin and describe the experience (he hated it). At the end of Carnival weekend it was promised Wiseman would fly at the race track. "There will probably be one of the greatest assemblages of people gathered there to witness the flights that has ever assembled in this city," gushed the PD. Come the last day of the Carnival, everyone was primed to see a man fly for the first time. "As soon as the airship was brought onto the track the immense throng of men, women and children were all attention," reported the Press Democrat. "Every movement of the bi-plane as it was wheeled along the track was watched with intense interest." Alas, the winds were choppy, so nothing to see - except for Wiseman's wave to the crowd and that little matter about the world speed record (68.7 MPH, if anyone cared). In the ten weeks following the no-fly at the Carnival, Wiseman was plagued with awful luck. The big tent near Windsor where he and Jean Peters built the plane burned, destroying all their tools, research notebooks, and spare parts. Fortunately the aircraft was moored outside the tent and unharmed. It was brought down to Noonan's field at the edge of Santa Rosa city limits (North Park, at the intersection of North St. and 15th is a good approximation) where Wiseman crashed it the next day in a test flight, completely destroying the propeller. Repair would be costly because the 7-foot, 6-inch propeller, along with the wing cloth lost in the fire, were the only imported parts used in construction. Damage was estimated at $1,000. Wiseman and his partners had no time to waste because the plane was due to be shown at the Fourth of July fair in Petaluma. With Peters and Don Prentiss he began rebuilding and remarkably the plane was fixed and ready to fly again, just two weeks later. Fred immediately crashed again, this time hitting a fence in Kenilworth Park on July 3rd. Confidence was apparently deeply shaken, both in Wiseman's flying ability and faith that they really had an airworthy craft. Plans were postponed for a follow-up exhibition flight in Petaluma: "The committee wishes to be positively sure that a flight will be made by the airship before it begins to advertise the event," reported the Argus, as well as, "Mr. Peters will be at the wheel when it flies again." Thus as it turned out, the first official public flight of the Wiseman-Peters airplane happened July 24 in Petaluma, with Jean Peters as the pilot. Both Peters and Wiseman continued practice flights at Kenilworth Park for the next three months without serious problems, although there was a mechanical failure on one flight that required the engine be sent to San Francisco. Wiseman took a break in September to visit the state fair, where he again competed in an auto race (results unknown, but he apparently did very well) and met with Charles Hamilton, the flying madman who is the topic of the following article and puts Wiseman's crash record in some perspective. While at Petaluma that autumn the team built a new aircraft, some 200 pounds lighter than the original. This plane was taken to Reno where exhibition flights were held for a week. They might have stayed longer, had Wiseman not crashed again and destroyed the plane. Despite the setbacks and particularly Wiseman's propensity for crashing their expensive airplanes, the Santa Rosa papers never lost faith in their hometown boy. Even when there was no real news, the Press Democrat especially kept cheering away. "Getting Ready To Build An Airship," read the headline in one non-newsworthy story. "Wiseman Smiles As Airship Flies," was another, and "New Airship Will Be A Dandy Machine." 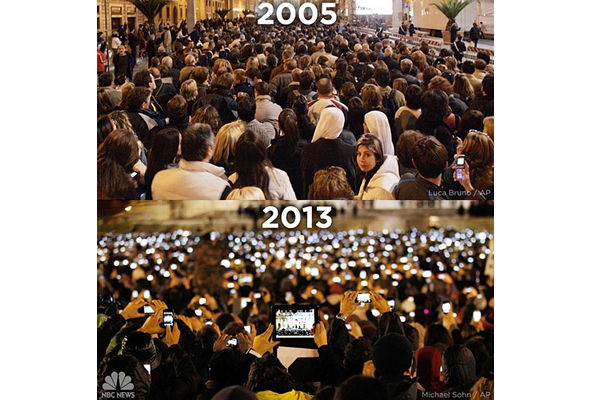 The year 1910 ended with Wiseman et. al. back in Petaluma rebuilding the plane that crashed in Reno. He was now talking about making a 24 mile trip from Petaluma to Santa Rosa. "There will be no flourish of trumpets prior to what Fred Wiseman hopes will be his next accomplishment," commented the PD. "That will be a great event, not only in the record of Fred Wiseman, but in aviation in this section." The Petaluma Courier added that he hoped to take Santa Rosa by surprise, landing "early in the morning in time for breakfast." From the aviation field on the Laughlin ranch at Mark West word came yesterday that Aviators Wiseman and Peters are putting finishing touches on their bi-plane and will have everything in readiness for the flights in readiness for the flights in Santa Rosa on the afternoon of May 8. As will be seen in another column, the Wiseman-Peters bi-plane will be on exhibition in this city prior to the aviation meet. It will be housed in a big tent on the big vacant lot at Fourth and Mendocino streets. For the general public a small admission fee will be charged, but a special free inspection and explanatory talk on the machine and its parts will be given the school children on some day during carnival week on which due notice will be given. The fame of the Wiseman-Peters bi-plane has gone far and wide from all over the state. Wiseman and Peters are receiving requests that they furnish aviation meets in many places. Some of the requests are of a very pressing nature, and they are guaranteed substantial financial renumeration. It is needless to say that they feel very much pleased over the attention being given the success of the efforts. As has already been stated Wiseman and Peters will make their first public flight in Santa Rosa on May 8, the day following the big Rose Carnival, and it will take place at the race track. There will probably be one of the greatest assemblages of people gathered there to witness the flights that has ever assembled in this city. Lee Bros. men on Thursday commenced to remove the big girders and other refuse from the big Brush lot on Fourth and Mendocino streets, and on the lot the big tent will be erected which will house the Wiseman-Peters bi-plane for several days during the Rose Carnival, and prior to its removal to the aviation field at the race track. At a small admission fee the general public will be admitted to inspect it. On a special day the children of the grammar grades and of the Ursuline College and St. Rose's parochial school will have an opportunity to see the airship free of charge. The Wiseman-Peters airship was brought into town last night and all night mechanics were at work assembling the big machine so that it can be inspected by the public today in the big tent on the corner of Fourth and Mendocino streets. It took three big wagons to haul the airship to town in its many sections, and the arrival of the wagons at the tent caused a big crowd to assemble and much interest was aroused. It will be remembered that the management promised to allow all grammar school children to take a peep at the airship free of charge. True to the premise the children will be admitted to the tent this morning between the house of nine and eleven o'clock, and it is safe to say that very few will omit the invitation. After that hour a small admission will be charged. The new engine will be installed in the bi-plane this morning and the machine will remain on exhibition until its removal to the race track to be in readiness for the flight on Sunday afternoon. An immense crowd gathered at the race track on Sunday afternoon to witness the racing and the aviation meet. The Wiseman-Peters bi-plane, built by Fred J. Wiseman and M. Peters, was ready to tour the air, but unfortunately the high wind of a choppy nature that prevailed, prevented a flight. The crowd, however, appreciated the unavoidable conditions and in consequence were contented with an inspection of one of the classiest airships ever built in this or any other country--by a number of experts pronounced the best--and saw it driven on the ground the full length of the homestretch with Wiseman mounted in the seat which he or Peters occupies when a flight is made. The boys have a machine that can fly and it is their hope before long, due announcement being given to everybody, to fly over Santa Rosa or at least give a free exhibition for everybody. They will keep their word. For the time being the airship will be again at the Laughlin ranch at Mark West, where the aviators will add some more finishing touches. No one regretted the wind conditions half as much as they did and that they were unable to fly. As soon as the airship was brought onto the track the immense throng of men, women and children were all attention. Every movement of the bi-plane as it was wheeled along the track was watched with intense interest. Fred Wiseman, in response to popular demand, was brought before the grand stand and was introduced by Ira Pyle, who manipulated the megaphone. Mr. Peters and Don Prentiss --the latter an assistant builder were similarly honored. There were calls for Ben Noonan, the treasurer and manager of the Wiseman-Peters bi-plane. Mr. Noonan's modesty, however, kept him in the background. To tell the truth, knowing Wiseman's daring, he was somewhat afraid that Wiseman would essay to brave the unfavorable wind conditions and attempt a flight. It was hoped by sundown that the wind would go down and make a flight possible, but instead of going down its "choppiness" increased, and so there was no flight. Prior to the bringing out of the plane the assemblage was entertained with a number of interesting motor cycle and automobile events. The spectators had the opportunity of witnessing the establishing of the world's record for motor cycle racing on a dirt track when Earhart, riding a Thor went five miles on his machine in four minutes and twenty-two seconds...It was a wonderful exhibition of speed when Earhart tore along the track at less than a mile a minute speed. The crowd shouted their enthusiasm. Misfortunes never come singly, Fred J. Wiseman and M. Peters, who spent several months building one of the finest airships ever built in the country, feel the truism of the old saying. Sunday afternoon the tent which housed their bi-plane on the Laughlin ranch at Mark West, was destroyed by fire, together with all their tools, the air-chars and valuable papers containing measurements and other data, some engine parts, a big roll of cloth used only for airships, and some personal effects. The airship, which was fortunately moored outside, escaped serious injury. It was the strong wind that blew the airship to a place of safety in the big pasture field after the fire had burned the strands of rope holding the machine to the outside poles of the tent. The fire caught the cloth on the rear plane and scorched it. Fortunately the fire was noticed and the flames consuming the cloth were extinguished. The loss is naturally a very heavy one on the builders, but nothing daunting they are going to repair the damage, get another new roll of cloth and new tools, replace their papers and in short, will not let the disaster of Sunday afternoon, shortly after 5 o'clock, stop them in their determination to make of their airship the greatest success possible. All their friends sympathize with them in their loss and congratulate them on their pluck. At the time when the strong wind at the race track prevented a flight of the Wiseman-Peters biplane, Fred Wiseman promised that at some future date he would give a free exhibition for everybody who cared to go to the big pasture field on the Laughlin ranch at Mark West. Pleased beyond measure with the successful flight he made last Sunday morning, and confident that everything was all right with the mechanism to insure successful flights in the future, Mr. Wiseman will give another tryout flight or flights next Monday morning at the Laughlin ranch, and the public generally is invited to come and here [sic] between eight o'clock in the morning and noon and witness the same. Monday being a holiday many people will doubtless avail themselves of the opportunity thus offered and it is possible that a train can be secured to run to Mark West on that day. It takes more than a contrary wind, breaking down of an engine, the burning of a tent, the blowing down of a tent, and other accidents to discourage Fred J. Wiseman and M. Peters in their plan to navigate the air in their biplane. Consequently the accident which befell their machine on Saturday morning, when a sudden gust of wind caused it to careen and come down on its side, smashing the propeller and one side skid and other minor damage has not phased the boys and they are already making repairs and mean to make a flight before the thousands of people who gather in Petaluma on the Fourth of July. Unannounced except to a few friends Wiseman had his airship out in the field on the Noonan place and gave it several runs across the field until about half past nine o'clock Saturday morning. Then the airship raised to a height of about thirty feet and Wiseman made a fine flight for about 150 yards. Two more flights were attempted then came the sudden veer of wind and the airship came down as described from an altitude of fifteen feet. Fate has apparently been against the boys but they are undaunted. Of course these accidents are very discouraging and possibly would make less determined aviators desire to "yump ye yob." But not so them. Fred J. Wiseman came to Santa Rosa yesterday morning and dropped in at the Press Democrat office to greet his friends, and his face wore the biggest kind of a smile. The reason for the very apparent good humor had preceded him. However, for a well known Petaluma resident had already reached town with the news that the Wiseman-Peter biplane had that morning made a very successful flight at Kenilworth Park in Petaluma. Fred was a very happy boy and his pleasure is certainly shared by his host of Santa Rosa friends. Fortune has at last smiled upon the efforts of the Santa Rosa boys, and everybody hopes it will continue. They have as has been claimed on many occasions, a machine that can fly. Of course, it takes practice to make perfect even in the flying and understanding of airships, and as Mr. Wiseman stated yesterday, everything cannot be learned in a day or a month. A re-adjustment of a part of the mechanism of the airship was made and now Wiseman and Peters say they are the masters of the situation. Last night's Courier had this to say among other things of yesterday morning's flight. "A few minutes before seven the machine was pulled down to the southerly part of the park and the engine was cranked with J. W. Peters at the wheel. The biplane ran some two hundred yards along the ground before arising. Mr. Peters had absolute control at all times and when off the ground made a flight of two hundred yards at a distance of fifteen feet in the air. The date of the aviation meet exhibition drill, etc., at Kenilworth Park in Petaluma has not as yet been set. It will not take place on Sunday as many local people think but has been put off until later in the month. The new date will be announced in the local papers in due time. The event was postponed as the committee wishes to be positively sure that a flight will be made by the airship before it begins to advertise the event. Mr. Peters will be at the wheel of the machine when it flies again and as he has already made several flights in the east, he will no doubt give a good account of himself. Three flights were made by the Wiseman-Peters Biplane in Petaluma on Sunday morning in the presence of a large crowd of spectators, many of whom were from this city, the interest in the success of the machine here being very keen as Fred J. Wiseman is a Santa Rosa boy and he and J. W. Peters and Don C. Prentiss put the airship together on the big Laughlin ranch at Mark West. The flights of Sunday are only the beginning of greater things to come for the development of the "know how" is all that is required. Those who have seen other airships have always said this airship could fly, and it si being demonstrated. While possibly forty feet was the height attained in Sunday's exhibition by J. W. Peters. It is know that the big bird can go much higher. The enthusiasm created at Kenilworth Park was such as made the hearts of the aviators glad. Fred Wiseman of local aeroplane fame, left Petaluma on Thursday for Sacramento, taking with him the engine from the aeroplane that has been housed in the tent at Kenilworth Park since the Fourth of July. According to the Argus Mr. Wiseman took the engine to Sacramento at the request of Aviator Hamilton, who desires to use it in his flights at the state fair, his own engine having proven practically useless. Fred J. Wiseman returned from Sacramento on Saturday night. He made a great record in auto racing at the State Fair, adding to his prior laurels. Mr. Wiseman went to Sacramento to see Aviator Hamilton on business and was at the track when the aviator had his serious tumble for a distance of one hundred feet. Hamilton escaped with some serious bruises. He was feeling somewhat better on Saturday morning when Mr. Wiseman saw him. "Reno, Nov. 17--Wrecked in his most successful flight before the Reno public, Fred Wiseman of Santa Rosa narrowly escaped injury at the race track today when his biplane was practically demolished. Rising 40 feet from the ground the birdman was aught in an air eddy from the grandstand, which he overtopped. This overset his machine, sending it crashing to earth. Wiseman was thrown out, but sustained no injuries. When up about 40 feet the biplane commenced to drop, diving straight toward the earth, where Wiseman managed to regain control and altered its course slightly, bringing it back to an even keel. It plunged to earth, the motor spinning furiously, and struck squarely in an irrigating ditch, this preventing the wheels from revolving and allowing a safe alighting. "There was a crash when the wheels crumpled underneath and jammed through the bottom plane and one of the wings bent and snapped. "The birdman shut off his engine as he struck, preventing the propeller from tearing the car to pieces. The sudden shock threw Wiseman from his precarious perch, straight into the wires and stays. He was caught in these and wavered to and fro for a few seconds as the machine quivered. Then he extricated himself and jumped away from the debris. The rebuilding of the Wiseman airship, which was damaged in the accident at Reno, Nev., is in progress in Petaluma, and it will not be long before Fred Wiseman will again take his seat amid the wings to fly aloft. "This airship sport has automobile racing licked to a frazzle," Wiseman smilingly observed to a newspaper friend in town on Sunday, when he was asked as to the feeling that came over one when mounting into the air and navigating about in space. "I tell you one thing--that a man has a far better chance of saving himself in an airship when she commences to drop than he has in an automobile race when the wheels skid or the gear goes wrong." Fred Wiseman has the airship spirit. He wants to fly. He says he has a machine now that will fly like a bird. There is no longer any question about it, and but for the squall of wind across the Reno race track there would have been no limit to which he could have attained. There will be no flourish of trumpets prior to what Fred Wiseman hopes will be his next accomplishment--a flight from Petaluma to Santa Rosa. That will be a great event, not only in the record of Fred Wiseman, but in aviation in this section. "A Courier reporter visited Kenilworth Park Thursday afternoon and as usual the men were found busy and preparing themselves for flights. "The Wiseman-Prentiss squad has removed their engine from the biplane taking advantage of the inclement weather to overhaul it. They have brought about a change in lubricating the engine, having attached taubes to the seat of the operator, whereby he can lubricate the engine while he is on a flight. "This is a decided advantage over the old system as the operator has plenty of difficulties without turning around to watch the engine. A larger tank has also been installed which will enable the biplane to travel a longer distance without refilling. "The cross country flight to be made to the county seat will occur shortly. Fred Wiseman will be at the wheel on the occurrence of the flight and has already mapped out his course. "He will have the park as a starting point, going directly south to Burdell's station, seven miles below this city. He will reverse at this location and proceed northeasterly following the lower range of the Sonoma mountains for a distance of about five miles then going west to Penngrove, after which he will go north through the valley, following the line of the Northwestern Pacific railroad to the county seat. "The entire flight will cover a distance of at least twenty-four miles. The intention of the aviator to go south is to tack against the wind which will tend to aid him to ascend faster. He has carefully mapped out this route, finding that he will have less obstacles to pass over his machine and life will be more safe. The aviator will take the county seaters by surprise and he intends to land there early in the morning in time for breakfast." It appears the Russian River resorts reached such a tipping point in the summer of 1910 when there was a jump in the number of visitors. "Already thousands of campers are at the different places and daily more are arriving. After the Fourth of July it is expected that a great many more pleasure and recreation seekers will journey to the famous river," commented the Santa Rosa Republican. "The trains coming from the resorts on Sunday carried about 18 coaches and two engines, the coaches being crowded." The Russian River resort scene had been growing steadily for more than a decade, with a new place or two opening every year. If you wanted to get away for a few days to swim and paddle around in shallow water or even just lounge away like a sloth in a tent-cabin, it was the best spot in the Bay Area. Although many resorts were more or less the same, some filled a particular niche. Mirabel Park was popular with groups holding Sunday picnics, Camp Vacation (near Bohemian Grove) had tennis courts, and so many Santa Rosans descended upon Rio Nido that it seems much of the town was there at some point over the summer, judging by the frequent notices that appeared in town papers. That history was discussed in an earlier offering, "When we Summered in Lost Places," and all that continued, as shown in items below. So what made 1910 different? For starters, it was the first season after the Northwestern Pacific (NWP) line finally connected with the narrow gauge railway coming up the coast. 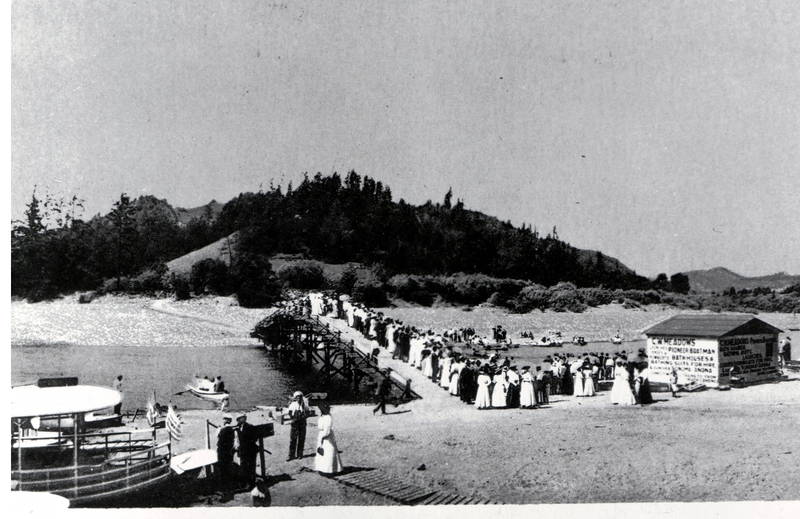 This meant someone in San Francisco could reach the most popular resorts at the west end of the river - Camp Vacation, Monte Rio, and that year's new hot-spot, Monte Cristo - without taking the NWP to Fulton and changing to the slooooow river local that crawled along with over a dozen stops along the way. This was also the year that electricity came to the resorts, so roughing it was no longer quite so rough. But the special sauce drawing the crowds, I believe, was live music. For the first time (at least, that I've encountered in the papers) a resort was promising there would be great dancing. "The Santa Rosa band will furnish music for the dance, and this is a sufficient guarantee of the excellence of the terpsichorean revelry," blurbed the Republican newspaper about the opening of Monte Cristo. "The dancing platform is one of the best on the entire river, and has ample floor space to accommodate large numbers of dancers." As everyone familiar with local history knows, the Russian River scene exploded in the years around WWII as the top Big Bands in the country performed at the resorts, with jitterbug dancing and hot jazz making the area a showcase for the best in popular music. In order for that to happen, however, visitor's attitudes needed to first shift away from viewing the resorts as less a get away place into a go to destination. "The bungalows on the river and the cottages at the seaside are the strong attractions now," wrote the Press Democrat's gossip columnist in 1910, striking a prophetic note. "Summer is on." "Monte Cristo," the Frank Leppos county home on Russian river, was thrown open last Monday by Mrs. Leppo for the entertaining of the ladies composing "The Spreaders." The club members were delightfully entertained and returning to town gently pleased with the outing. The formal opening of Monte Cristo, Frank Leppo's splendid new summer resort on the Russian river, will be one of the events of the season in that section. The Santa Rosa band will furnish music for the dance, and this is a sufficient guarantee of the excellence of the terpsichorean revelry. All the arrangements for the pleasures of a large attendance have been perfected by Mr. Leppo, and he has left nothing undone which could in any manner add to the pleasure or comfort of his guests. Busses will be run from Monte Rio's hotels to the new resort, in order that patrons may be in attendance at the dance and those who wish to go from this city to attend can find accommodations at the Monte Rio hotels. From all accounts the picnic of the Irene Club at Rionido must have been one of the most enjoyable ever. It occurred last Wednesday and the members left this city on the morning train and carried with them well-filled luncheon baskets. The lunch was made up on innumerable dainties for each member contributed to the feast. I was assured by one of the Irenes after this manner: "The Irenes can cook and don't you forget it." Delighted! Cooking is a very useful and necessary accomplishment. The exhilarating weather, the swimming and the hiking and the pleasures of the outdoor life were all features of this never-to-be-forgotten outing at Rionido. At noon everyone was perfectly ready for the meal, which was spread in the dining room at the bungalow of Mrs. Charles A. Wright, Mrs. Wright being a charter member of the Club. During the enjoyment of the many courses of menu there was much laughter and merriment. some of the members returned home in the evening while others remained overnight with friends and returned the following day. A number of resorts are making preparations for the Fourth of July. Hundreds of people will go to that section to enjoy the two days' vacation and adequate quarters will be provided. Many of the camps will celebrate with exercises, while a majority will confine their sports to a grand ball in the evening. Okay, we've got good news, bad news: Tonight you'll see something beautiful and astonishing. Then you just might die horribly. 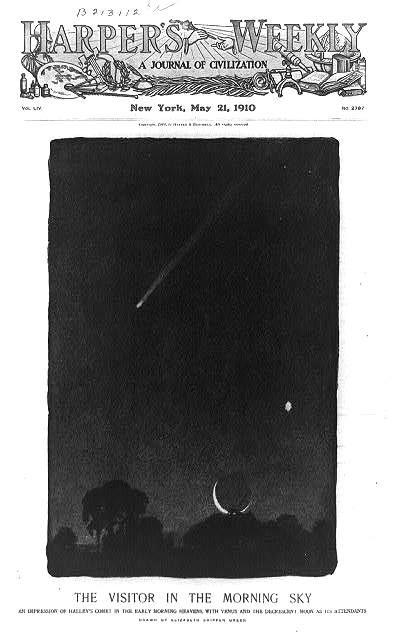 Such was what residents of Santa Rosa and elsewhere expected as they awaited the appearance of Halley's Comet in May, 1910. This would be no faint astronomical drive-by; the comet would be unusually close to Earth, which meant it would be easily visible without a telescope and even take up a large swath of the sky - just before daybreak on May 16, the tail was measured at 90 degrees long. It promised to be quite a show and Santa Rosans didn't want to miss it, although the best viewing time would be after three in the morning. So many people called the Press Democrat requesting a wakeup call if the comet was visible that the paper assigned a "Comet Editor" to collect phone numbers. 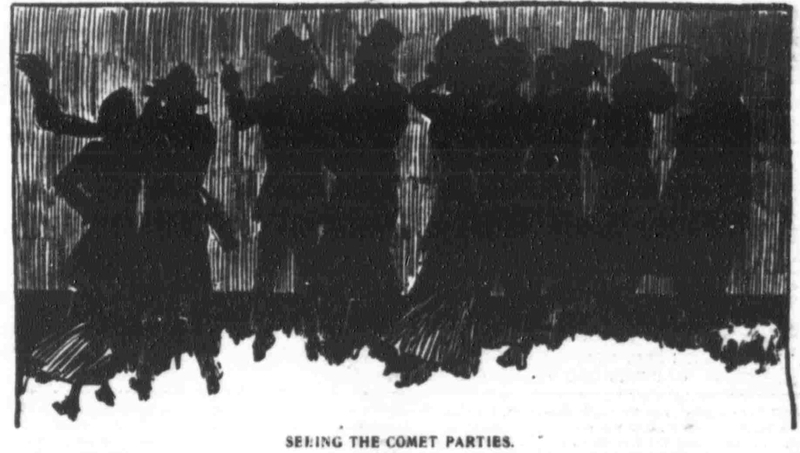 Like people in the rest of the country, locals began planning "comet parties" lasting through all or most of the night. The PD ran a tongue-in-cheek item about what to wear at a comet party: "If the party is in the nature of a private or family reunion the guests may go more or less decollete, or simply in 'nightie...'" The gossip columnist noted some were actually having little parties with friends, starting with a midnight snack followed by a few hands of cards until it was time to wander out to the yard or porch. Those with autos drove out in the country. One man was nearly arrested for climbing the big rubble pile of bricks at the corner of 4th and D streets (which also reveals that debris still remained downtown more than four years after the great earthquake). BOSTON, Mass.. Feb. 7.— A telegram received here today from Yerkes observatory states that the spectra of Halley's comet shows very prominent cyanogen bands. The fact that cyanogen is present in the comet has been communicated to Camille Flammarion, the distinguished French scientist, and is causing a great deal of discussion as to the probable effect on the earth should it pass through the comet's tail. Flammarion is of the opinion that cyanogen gas would impregnate the atmosphere and possibly snuff out all life on the planet. A version of that wire service story appeared in papers everywhere three months before the comet became prominent, giving the public plenty of time to figure out that cyanogen was more or less deadly cyanide, and it couldn't be good for your cute little planet to be swimming in the stuff for seven long hours. Unfortunately, no newspaper explained (as far as I can find) that Earth would be only in the edge of the tail so it really was more like wading than swimming, and that everyone survived quite nicely a much more serious contact with a comet tail in 1861. But the papers really failed by warning about the end of the world just on the reputation of Camille Flammarion, described in some places as "one of the greatest living scientists" and an "eminent astronomer." True, he had been a founder of the Astronomical Society of France in the 1880s, but now he was a 68 year-old card-carrying crackpot who not only believed there were canals on Mars, but that the weather there was quite nice and supersmart Martians were hoping we'd pick up the phone and communicate with them. Oh, and he had written a novel about the world ending because of a comet. The threat wasn't real, but the fear of it drove a few mad. At least two people supposedly dropped dead at the sight of the comet. A man in Arizona was scared it was chasing him. A watchman at a San Bernardino mine believed it was going to hit the earth, and thought for some reason the best thing to do was nail both hands to posts; after nailing one of them he discovered he no longer could manage to hold a hammer and rescuers found him in great distress. If we die, we'll croak in glee. And watch for sights amazing. If we pass, we'll pass a-dancing. Sadly, local humorist Tom Gregory didn't address this possibility in his item on comet party etiquette. What does one wear for an end of the world get-together? Something more formal than a "nightie?" Something less? PRESS DEMOCRAT RUNS A "COMET BUREAU"
"Won't you please phone me when the comet appears?" Many people know that the newspaper men in the Press Democrat office necessarily keep late hours, and the above show the kind of requests that have been coming into this office galore for several days past. Shortly after three o'clock this morning when the comet was visible something like a score of telephones rang in different houses in response to the request to tell when the comet appeared. If you want to be called let the Comet Editor know, and if there are not too many of you, you will be called all right. In a large vacant space formerly occupied by the Athenaeum and Hahmann building, Police Officer George Matthews about 3 o'clock on Tuesday morning noticed a man acting very suspiciously. He was dodging in and out among the piles of brick. Every once in a while he climbed up on top of the brick pile. Then he assumed a crouching attitude. Then he would gaze upward into space. Matthews investigated with due precaution and discovered that the man, acting so suspiciously was none other than "Bud" Parks, who had left his bed early in the morning to take a peep at Halley's comet and his movements among the brick-piles was for the purpose of getting as good a view as possible of the sight in the heavens. "If the party is in the nature of a private or family reunion the guests may go more or less decollete, or simply in "nightie." If the lawn has been sprinkled and the starry visitor with caudal of asteroids cannot be received from the door or window, it is well to hunt up a pair of slippers. Should the reception take place up on the next block, the decollete should be supplemented with a shawl or "hubby's" overcoat. If the "nightie" is retained it may as well be covered with a bath-robe. Should the bath-robe be unable to be found--as may be the case--the piano cover or a rug will be a practical substitute. Whatever worn it might be well to meet the comet on blocks where the street lights burn dim. The comet will give enough illumination for his own exhibition." "Mr. and Mrs.-------" request the pleasure of your company. To see the Comet. From twelve-thirty to three-thirty, morning." There is no mistaking the fact that Mr. Halley, astronomically and socially, furnished considerable diversion to the social calendar of Santa Rosa last week as far as late at night and early morning functions are concerned, and while the invitations may not have been quite as formal as the one suggested--having been mainly to the response of the tinkling of the phone-bell -- the "R. S. V. P.s have not resulted in the disappointment of host or hostesses. The assemblies have been held principally on porches, in front yards, street corners, or any place of vantage in easy access; decorations Nature as revealed in rose blooms and moonlight. I might add that the gowns worn in some instances had a rainbowy effect, but everybody wanted to see the Comet and no time was given for the preparation of party dresses. In several instances Santa Rosa set the social pace in informal comet parties, where friends have gathered about half-past twelve to enjoy light lunches, play a few games of euchre or five hundred, and wile the time away until the watch on the outside announced Halley's big sight in the heavens was ready for the evening. Several ladies and gentlemen who own automobiles, have driven into the country so as to get a better view of the comet without the near-earth dash of light furnished by the electrics in town interfering. For several mornings to come Halley's comet will continue to promote star gazing and it is affording lots of fun, too. ...The earth entered the tail 16,000,000 miles from the nucleus and fully as many more miles of the light-flood swept over us to be lost in the void beyond the globe. They are millionaires in the matter of miles out in the measureless interstellar territory. Distance is no object, when they mark off a star's stunt through the solar spaces. And they are as prodigal with time as an American city official is with the public coin. While the sun, comet, earth and Santa Rosa were in conjunction--for seven hours--the illuminant particles of the tail, making a fleece of light as thin and as bodiless as vacuum, were washing us in their unknown white fire. The composition is unknown, although for several centuries every astronomer under the sun has been giving us a different chemical formula of it so simple that any drug store clerk could have a comet-tail of his own. We have been told that it largely contains cyanide of potassium, or hydrocyanic acid, or prussic acid, or oil of bitter almonds, or--or cyanogen (which is the word I am trying to get; still, the others belong to the same family). Cyanogen is the active principal of prussic acid and will kill even at long range, if not taken in exceedingly homeopathic doses with a physician and a pretty professional nurse at hand for emergencies. During the transit no person in Santa Rosa experienced any prussic acid sensations, although several living in the eastern portion of the city said they smelt bitter almonds, I imagine it was the tannery. Regarding the disasters, cataclysms, holocausts and other unpleasant happening attendant upon comets, none has been reported to this office at this writing. 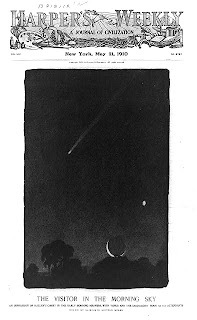 There is no evidence relevant, competent and material, that the troubles of Mr. Taft are in any manner connected with Halley or his periodical phenomenon; of the Ballinger or Wickersham may be attributed to the cyanogen in the comet's tail. Col. [Teddy] Roosevelts's appearance in Europe simultaneously with the starry wonder is not universally accepted as one of the prognostications of peril. The proposed visit of Mr. Hearst to England during the national mourning time for the dead Edward [VII, King of England] may be significant of two sad events bumping together...It was reported from Sebastopol that the auroral display was "on" in the southwestern heavens, but investigation proved that it was only a brush fire on the Blucher Rancho. A startling rumor flashed down from Fulton that a man in that town had been struck by a meteorolite [sic]. Later advices somewhat modified the account and told that he had been kicked by a vicious mule. At least in the county there was no sting in the comet's tail. Notwithstanding other observers and other localities are now trying to discredit the tail part of the show, we do not. If we are to believe that a pile of rocks, 100,000,000 miles in diameter has traveled on its elliptical orbit 4,000,000,000 miles, swishing its tail 32,000,000 miles long and 13,000,000 miles wide, and is halted by Venus when 14,000,000 miles distant from that charming lady star--I say, when we are handed all these millions and millions of miles to get over before we can get to even "a reasonable doubt" of our own insanity and when we are told that a flood of light composed of nothing, and more vacant than vacuum, blown here and there by the mere undulations of sunshine, will touch us, and we get that through our "cocoanuts," why,--it DID touch us, and we will stick to the belief as tenaciously as the cat that sat down on the flypaper. After months of lying low in Japan, the key witness in the attempted murder case against Burke was brought back to Sonoma County, amid new questions of who paid for her trip and who wrote the confession letters signed by her - letters not mailed until weeks after she had left the country. 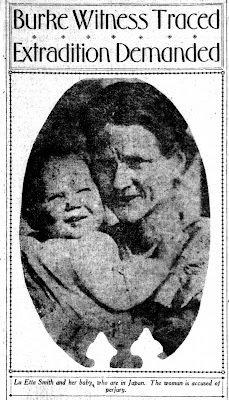 Our basic story so far: In February, 1910, Dr. Willard Burke was arrested for allegedly trying to kill Lu Etta Smith and her infant son by blowing them up. Investigators discovered Burke, who owned a gold mine as well as the sanitarium near Santa Rosa, had visited his mine and was shown how to use explosives, departing with six sticks of dynamite. The Grand Jury indicted Burke for attempted murder, but in a surprising twist, also brought charges against him for performing an abortion on a different woman (abortion was considered second-degree murder at the time, but few were prosecuted). Smith testified she was Burke's mistress and he was the father of her child. Not long after her court appearance, Lu Etta and her son disappeared. She was found to be in Japan, which was curious because she had no known income outside of gifts of money from Dr. Burke. The Sonoma County Sheriff issued an arrest warrant for perjury so she could be extradited back to the U.S. if she did not come willingly. More background is available in the previous article, and it should be noted that at this time in the chronology, the Press Democrat simply gave up in trying to summarize the backstory in each article, writing simply, "the public is already in the possession of so much detail concerning the case that repetition at this time is unnecessary." Also, here's some missing background: Was the victim named Lu Etta, Luetta, Luella, Louella, or Lou Etta? Newspapers at the time used all these variations, sometimes more than one in the same article. By the time the trial began the Press Democrat just started calling her as "Lu." But the name on her death certificate and in the only census in which she appeared was "Lu Etta." And while we're on the topic of her origins, she was born in Missouri in 1870 and had only a seventh grade education. Lu Etta Smith's return sparked renewed media interest, and the story was again front page news. Then a few weeks later in October, a powerful explosion destroyed the Los Angeles Times building killing 21 and injuring scores more. Union activists were suspected, but it would be several months before that was proven and arrests were made. All that was known in the weeks following the bombing was lots of dynamite was used and it was suspected to have been purchased by men posing as gold miners in Placer County, meaning there were now two high-profile crimes involving dynamite from the Sierra Nevadas on the front pages. With the intense media interest surrounding both cases, a man registered at Burke's Sanitarium a few days later. As told in an history of the LA Times bombing, he immediately raised eyebrows among residents at Burke's because he didn't appear to be ill and acted suspiciously; he didn't socialize and hid whenever an auto approached. He had a "peculiar looking eye." A suspicious resident at the sanitarium called the Oakland police and the captain of detectives soon arrived. In tow was a phalanx of reporters, apparently eager to somehow tie Burke into the new dynamite story. Dr. Burke told them the man - who was never precise on his exact name - had stayed only a day and claimed to be a private detective investigating another patient who was a possible suspect in the Los Angeles bombing. The fellow who called the cops quipped, "He said he was a detective in search of the dynamiters. I told him he jolly well looked like one of the dynamiters himself." NEXT: DO YOU LOVE YOUR GOLD OVER YOUR CHILD? LU ETTA SMITH IS ENROUTE TO U.S.
Lu Etta Smith, missing witness in the case against Dr. Willard P. Burke, will be here long before the trial of the case is set. The woman is now en route to this coast from Hawaii, where she has been for several days. The witness is expected to reach here in a few days, and when she comes it is anticipated there will be some startling revelations concerning her disappearance. Miss Smith and her child have been absent for some months, and owing to her absence the trial of the case had to be postponed until November. Now that the officers have her in custody a strict watch will be maintained on her to see that no inducements are offered to have her in custody a strict watch will be maintained on her to see that no inducements are offered to have her depart again. It was a matter of common report that agents of Dr. Burke had negotiated for the disappearance of the woman when she left the File home in Berkeley some months ago, and made the journey to the Orient. It is believed she was paid a large sum of money to leave here and take the trip, with the idea that she would be kept away until after the trial of the case. Two weeks ago last Saturday Sheriff Smith received a cablegram from United States Consul Sammons from Tokio, stating that Lu Smith had been apprehended...the officials determined on secrecy, their plan being to get the woman landed and have a talk with her prior to letting anyone know of her return. They had reasons. But the news leaked out and confirmation was given it, as said, yesterday afternoon. "I have already learned from Lu Smith that she was furnished with money to get out of the country and avoid being a witness at the Burke trial. I will not state now who it was that gave her the money. But she has corroborated evidence I had already in my possession." "No. I cannot say who it was," replied the public prosecutor when pressed by newspaper interviewers. "I will wait and see Miss Smith first," he smiled. ...From witnesses examined at another Grand Jury investigation it was learned that Mrs. Marian Derrigg, a personal friend of the Burke family, had made a number of calls upon Lu Etta Smith at the File home in Berkeley. The purport and nature of the visits have not been told, but Lu Etta Smith may throw some light upon the matter. Lu Etta Smith is not returning to this country as a prisoner under arrest in the legal meaning of the term. In Japan she had two courses open to her as regards her manner of return. She could either figure in extradition proceedings and come home a prisoner, or else return as a passenger, merely under the supervision of some of the steamship officials. She agreed to the latter course, extradition proceedings were unnecessary, and she is said to have exhibited a willingness to return. District Attorney Lea received a letter from Lu Etta Smith from a port in Japan. When asked concerning the contents of the letter yesterday he declined to state, and was equally uncommunicative as to whether the letter had tarnished him with the information concerning the identity of the person who is said to have furnished Lu Etta Smith with the money for her trip. Upon the arrival of the woman and her child they will be cared for until the trial. They will be given proper accommodations where a watch can be kept upon them and there will be no danger of any more ocean voyages. District Attorney Lea is particularly pleased at the return of Miss Smith as she will be able to explain her purported signature to a letter forwarded to him some three weeks after her disappearance which contained an alleged confession of here that Dr. Burke had no connection with the dynamiting. District Attorney Lea has already learned that Miss Smith has not changed from this story of the details of the occurrence related by her from the first. Dear Sir--I hereby acknowledge that I very much regret the explosion which took place in my tent at Burke on the night of February 5, 1910. I hereby exonerate Dr. W. P. Burke from all blame in this explosion and also hereby confess that I did this myself, and therefore ask that all criminal proceedings against him be dismissed at once. I would also ask you to have this letter put in the newspapers. I have written Dr. W. P. Burke exonerating him from all blame. 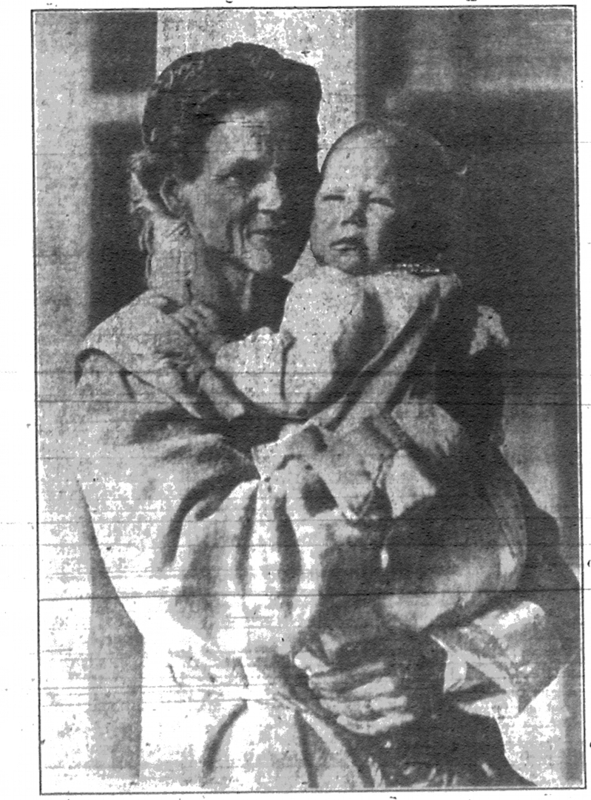 Lu Etta Smith and her child arrived in Santa Rosa last night on the 5:47 o'clock train, accompanied by Sheriff Smith and District Attorney Lea. These officials met them upon their arrival in San Francisco from Japan on the steamer Chio Maru yesterday morning. With the return of Lu Etta Smith came the confirmation by her that she was given the money to pay for the passage of herself and child to the Orient by Mrs. Marian Derrigg. Mrs. Derrigg, as has already been told, was a patient for some time at Burke's Sanitarium, and is said to be a personal friend of the Burke family. The statement by Miss Smith that Marian Derrigg had handed her the money was again reiterated last night. Mrs. Derrigg's whereabouts at the present time are unknown. She was last seen in San Francisco at the time of the departure of Lu etta Smith at the File residence in Berkeley where the negotiations for the payment of the money were made. It was a cleverly worked out scheme. Mrs. Derrigg went to Berkeley where she posed as a wealthy woman. She opened up negotiations with a real estate firm for the purchase of a piece of property known as Craig Mont. Craig Mont chanced to be in the vicinity of the File residence, where Lu Etta Smith was stopping. Having previously known Miss Smith at the Sanitarium, it was an easy matter to get an interview with her under the guise of the former acquaintance and solicitude for her welfare. Mrs. Derrigg is said to have told Miss Smith that it would be better for her to get away to some other clime where she could forget her disgrace. The woman listened, and when Mrs. Derrigg proffered the necessary money for the trip to Japan, Miss Smith agreed to go. While the negotiations were in progress Mrs. Derrigg was making trips to and from the Sanitarium. She is said to have given over the money in greenbacks, and to have visited the Sanitarium the night before. One of the first things Miss Smith did aboard the vessel was to tip a steward a five dollar greenback, taking the bill from a big roll. Lu Etta Smith also positively denies the authenticity of the letter sent to District Attorney Lea on May 3, 1910, and postmarked San Francisco, which stated that Dr. Burke had no connection with the explosion and she herself was responsible. This letter was mailed three weeks after the departure of the woman and her child for Japan. They had sailed on April 19. From the start District Attorney Lea doubted the validity of the communication, and for that reason up to last night he had refused to make ti public. The full text of the letter is given above, published for the first time. Miss Smith stated yesterday that she had sighed her name to several blank sheets of paper at the request of Mrs. Derrigg, being told that the signatures were wanted merely for samples of her handwriting. She knew nothing of the contents of the letter until told upon her arrival in San Francisco yesterday. To the home of a missionary, a minister from Chicago, at Karagswa [sic - it was Karuizawa], Lu Etta Smith went with her child. The place is some distance from Tokio. To him Miss Smith told her story. The missionary communicated the facts to American Consul Sammons at Tokio, and he cabled the authorities here, telling of the location of the woman prior to this, on the way to the Orient, Miss Smith had disclosed her identity and had told her story to some women passengers on the steamer China. Not only was the woman's passage to Japan paid, but it was also agreed that she should receive payments from time to time. These payments were never forwarded to Japan. The news that Lu Etta Smith and her child were coming on the 5:47 train last night resulted in a crowd of interested people gathering at the depot. When the woman and child alighted from the train in company with the sheriff the crowd pressed around her. While she looked pale, it was evident that the woman's physical condition has improved by her trip abroad. She and the child were escorted to a carriage and were driven to the home of Special Officer and Mrs. H. T. Ramsey, where they will make their temporary abode, prior to the making of other arrangements. Miss Smith will be watched from now up to the time of the trial of the Burke case (during] the latter part of November. No complaint will be sworn out against the woman to detain her here as a witness. She will be subpoenaed as a witness immediately. There will be no trouble about the matter, and she will not get out of sight again. She will willingly testify at the trial in November. District Attorney Lea was asked last night whether there would be any complaints sworn out, in view of the confirmation of the story as to who paid the money to Lu Etta Smith to get her to leave the county and thus avoid being a witness at the trial of the case. He replied that there would be none at present. "It is unnecessary just now," the prosecutor said. Mr. Lea did not attempt to take an official statement from Miss Smith yesterday. He went to the metropolis unaccompanied by a stenographer, and when the train arrived here last night, the woman and child were taken at once to the Ramsey residence. District Attorney Lea last night declined to state the amount of money paid Lu Etta Smith. It is said to have ranged as high as $500, but this is only guessing. Mr. Lea, of course, has much other valuable information in his possession which he will not make public at present. Naturally the outcome of the case is awaited with considerable interest. The letter quoted above, and whose authenticity as far as she is concerned, is denied, was in typewriting, a considerable space being between the last line and the signature "Lu Etta Smith." The public is already in the possession of so much detail concerning the case that repetition at this time is unnecessary. A week after a woman and her baby were almost killed with dynamite, Santa Rosa found a media circus camped in its backyard. In February, 1910, an explosion awoke residents at Burke's Sanitarium, a well-known nursing home and resort on Mark West Creek. The cause was dynamite in a tent house occupied by Lu Etta Smith and her eleven month-old baby; the child was uninjured and the woman suffered a couple of bad cuts. It was first said that it was a suicide attempt as she was reportedly despondent, and much was also made over the fact her sister had died in an insane asylum. A friend told reporters she was only despondent because she felt ostracized by the other residents, although she had lived there since shortly before her baby was born. Within a couple of days the Sonoma County District Attorney came to the conclusion that it was an attempted murder case - a long fuse had been lit outside of the tent. But where did the dynamite come from? Suspicion fell upon Dr. Willard P. Burke, the owner of the sanitarium. Burke also had a mine in Butte County that famously struck gold the previous May, making him a very wealthy man. It was known that he had recently visited the mine, and the Sonoma County sheriff traveled there to try to determine if Burke had left with explosives. In this first week after the incident, Lu Etta remained sequestered at the sanitarium and not available to any of the reporters from the San Francisco newspapers clamoring for an interview. She was allowed to speak to one man who she believed was a reporter, but was actually an attorney for Dr. Burke. Meanwhile, Burke's sister-in-law emerged as a spokesperson for the family and repeatedly stated Lu Etta was mad as a hatter, had threatened to drown the baby, and probably had the stick of dynamite in her mouth before she lost her nerve at the last moment. The DA had Lu Etta moved to the county hospital, where she was now available to journalists. She told them Burke was the father of her child - who was named "Willard P. Burke Smith" - and they had carried on an affair since 1906. When asked about this, Burke's sister-in-law claimed many babies born at the sanitarium were named after the good doctor. When the sheriff returned, Dr. Burke was arrested and charged with "using an explosive with intent to injure a human being." The shocking news spread quickly around Santa Rosa and a large crowd gathered at the courthouse to see Burke arrive for his arraignment. The $20,000 bail was immediately posted, with Burke being represented in court by attorney James Wyatt Oates. The account here continues with just local Press Democrat coverage of the story, as outside reporting was sometimes sensationalized and unpredictably muddled. Still, the PD did neglect to mention some important details, such as Lu Etta's Berkeley connections, which were important to know in one of the developments transcribed below. She was studying philosophy at UC/Berkeley during 1907 and 1908, living at the time as a boarder in the home of William File, who told reporters she had no suitors but visited Dr. Burke in San Francisco once a week. After she moved out the File family received a letter that she had married and had a child. The PD also did not mention Burke having told a colleague months before the explosion that he expected she would someday commit suicide by using dynamite. NEXT: WHO HID THE KEY WITNESS? Oroville, Feb. 14--Positive evidence has been secured here that Dr. W. P. Burke, of Burke's Sanitarium, Sonoma county, secured six sticks of dynamite from his mine at Kanaka Peak, Butte county, on December 20. The officers declare that they have a complete case against him. On December 20, while on a visit to his mine the dynamite was given to Dr. Burke by Thomas Riley, a miner employed by Burke. He was given careful instructions in regard to preparing and firing the fuse by James Hedge, the foreman, and Riley, and he listened to what they said with the closest attention. The men prepared and fired a charge for his instruction. Dr. Burke explained that he wanted the dynamite for the purpose of blowing up a boulder at the Sanitarium. Dr. Burke again visited his mine on February 1, and told the man, in response to the questions they propounded, that he had touched off the dynamite and it had completely shattered the rock. Sheriff Chubuck of Butte county and Sheriff Smith of Sonoma county secured the final evidence. At first it was believed that the dynamite had been secured at the Phoenix mine at Hurleton, but the officers declare now that it was obtained at Burke's mine at Kanaka Peak, which is far more remote and unfrequented spot. District Attorney Lea, Sheriff Smith and Court Reporter Scott, all of Sonoma county, arrived here today and left for Kanaka Peak mine to take depositions. That no time is being lost and no detail of importance overlooked in the investigation being conducted to fix the blame for the dynamite explosion in Luella Smith's tent at Burke's Sanitarium, was demonstrated on Monday morning in the departure of District Attorney Clarence Lea, Sheriff J. K. Smith and Court Reporter Harry Scott from Santa Rosa, their destination being Oroville, from which point the Sheriff brought important evidence, which led to the arrest of Dr. W. P. Burke on Sunday afternoon. Their mission was to take statements of people and thoroughly investigate...in Butte county, where Dr. Burke's mine is located. Assistant District Attorney Hoyle took a little run out to the county hospital on Monday, and while they cautioned Luella Smith not to permit herself to be interviewed by anybody regarding the case and absolutely not to talk. He left similar instructions with the matron, Miss Margaret Lindsay that no one be permitted to interview the woman. The object of this precaution is evidently to prevent any overtures being made to her, and to guard against the visit of any bogus newspaper interviewer solely for the purpose of getting some statement from her. Deputy Sheriff Reynolds went out to the sanitarium on Monday and returned with the section of the tent torn by the explosion. This, of course, will be preserved as evidence for the trial. It is stored away in a safe place. A party of newspaper men and women motored out to the Sanitarium on Monday afternoon for the purpose of talking, if possible, with one or two persons there. After they had called upon Bookkeeper Reese at the office and made known their desire he carried a message inside. The answer came in the person of Dr. Burke's brother, who politely, but firmly told the party to leave the premises at once, and further that they need not return. So there was nothing to do but to go, and they did so. It was a very pleasant auto ride to the Sanitarium though, and the party enjoyed it. The rumor that followed the arrest of Dr. Burke that the sanitarium would be closed is not correct. The institution will be run as before and Dr. Isaac Burke, brother of the head of the institution, will assume active charge. A number of patients arrived at the sanitarium on Monday. A woman writer on a San Francisco paper had supper at Burke's Sanitarium on Monday night after her arrival on the evening stage from Fulton depot, where she left the train. She was assigned a room there and was for the time being supposed to be a new patient. Some one recognized her, however, and a hint was given that a horse and buggy and driver would be at her service for a drive to Santa Rosa. She preferred to accept the ride, although possibly she could have remained over at the sanitarium had she so desired. Luella Smith's brother, Edgar Smith, of Upper Lake, came to town on Monday and visited his sister at the county hospital. Tears were shed by both and they conversed for some time. He means to help his sister. Smith declares that there never has been any question as to the sanity of Luella Smith. Another sister died in the asylum. The brother is about sixty years of age. WAS FEAR OF CONTEST FOR BURKE WEALTH A MOTIVE FOR THE CRIME? Dr. W. P. Burke having been formally charged with the explosion which narrowly escaped killing Luetta Smith and her 11 months-old son, it is now reported that the authorities will attempt to show that the motive for the crime lay in the fear of a legal contest for the wealth of the child's alleged father, Dr. Burke, estimated at from $200,000 to $250,000. This theory, it is said, will be laid before the Grand Jury as supplying the motive for the crime. It may also offer an explanation for many of the sensational features that have developed in connection with the case. It is known that Attorney Naylor has secured depositions in Sonoma, Lake and Alameda counties in support of the contention that Dr. Burke is the father of Luella Smith's child. Naylor is still working along that line. As a result it is expected that suit will soon be brought against Dr. Burke in an attempt to secure a goodly portion of his estate for the use of the infant child and its mother. For the matter of a year or so it has been common report that as a result of a successful mining ventures Dr. Burke was rapidly becoming a wealthy man. Some are asking whether this phase of the matter has any bearing on the case. Last Saturday night Attorney Naylor came up from San Francisco and shortly after dark made a hurried trip to the county hospital, where he is alleged to have secured a deposition from Luella Smith. He appeared anxious that his coming should not be known, and it was not until the following day that the object of his visit was ascertained. It is believed that one of Naylor's important witnesses will be Dr. A. W. Hitt, formerly employed as an assistant physician at Burke's Sanitarium. In a letter written by Hitt to Naylor last December he (Hitt) said he did not intend to remain at the sanitarium much longer. "There is too much talk of dynamite," wrote he. The letter concluded as follows: "Please preserve this letter as we may need it later for evidence." 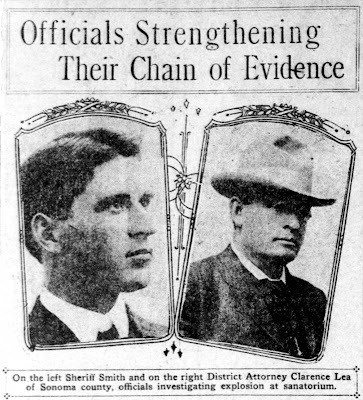 District Attorney Clarence F. Lea, Sheriff Smith and Court Reporter Harry Scott are now in Oroville, having arrived there last night from the Burke mine at Kanaka Peak. They are expected home this evening. A message received here last night from District Attorney Lea says that upon arriving at the mine they found that Thomas Riley, the miner, who last week gave out the information regarding Dr. Burke's visit there in December, had been discharged. While the reason for the discharge is not known here, it is assumed that it was because Riley "talked too much." Riley will be on hand an one of the witnesses for the prosecution when the case comest to trial. Dr. Burke drove into town yesterday afternoon, for the first time since being placed under arrest Sunday, and had a consultation with his attorney, James W. Oates. It is reported that Hiram W. Johnson of San Francisco, a well-known criminal lawyer, and prominently mentioned as a possible candidate for Governor at the approaching election, is to be associated as counsel for the defense. Dr. Burke has apparently lost none of his calmness and dignity as a result of the sensational developments of the past few days, his appearance and demeanor being much the same as usual. He was accompanied by two ladies, one of whom was Mrs. Alfred Burke. This is the day set for the Grand case and a number of witnesses are already on the ground. Dr. A. W. Hitt and Attorney C. E. Naylor came up from Oakland yesterday, and former Chief Clerk D. W. Dillard was likewise among yesterday's arrivals. Thomas Riley, the miner, who found himself suddenly discharged after telling the details of Dr. Burke's visit to the Kanaka Peak mine last December, is reported to have come in on last night's train. Numerous summons were sent out Thursday for local witnesses and it is reported that altogether between fifteen and twenty people will appear before the inquistorial body. It has developed that the real object of the systematic search made at Burke's Sanitarium last Sunday was to locate if possible the five missing sticks of dynamite, which according to the theory of the prosecution ought still to be somewhere in that vicinity. Riley the miner stated that Dr. Burke took six sticks of the explosive away from the mine. The prosecution is convinced that one was used by Dr. Burke is an attempt to blow Luella Smith and infant son into eternity. If so, where are the other five? Some of the San Francisco newspaper men now here have put in part of their time during the past few days trying to solve this phase of the mystery, and repeated searches have been made of likely places in the hills surrounding the sanitarium. But so far their efforts have all prove unavailing. Attorneys Thomas J. Geary and J. R. Leppo will probably have charge of Dr. Burke's defense. For several days negotiations have been under way looking to this end, and it is understood that they were presumably concluded yesterday. If Attorney Hiram Johnson of San Francisco appears in the case, it will probably be at the request of interested San Francisco parties. Following one of the most sensational investigations ever conducted by a Sonoma county Grand Jury, Dr. Willard P. Burke, head of the well-known sanitarium that bears his name, was yesterday afternoon indicted upon two counts. The first of these is for the alleged dynamiting of the tent-cottage on the Sanitarium grounds occupied by Luetta Smith and her eleven-months-old babe on February 5 of the present year; and the second is for an alleged abortion committed upon a young married woman of this county on January 10, 1909. The first indictment was not unexpected, in view of the startling developments that have followed from day to day since the news of the explosion was made public. The second indictment, however, came somewhat as a surprise, although in the earlier days of the investigation there were hints that proofs of such practices would be unearthed. The woman upon which the abortion is alleged to have been committed was subpoenaed to appear before the Grand Jury yesterday, but her extremely nervous condition, following a collapse when served with the subpoena at her home the night before, made her personal appearance out of the question. In view of her condition, her deposition was taken, setting forth the alleged facts in detail; and when this was presented to the Grand Jury at yesterday's session, the indictment referred to promptly resulted. During most of the afternoon Dr. Burke had been closeted with his attorneys, Hiram Johnson and James Rollo Leppo, in the latter's office in the Santa Rosa Bank building. At times he could be seen standing in the office window gazing across at the building before whose bar of Justice he will later be called upon to appear. Tall, a long black raincoat covering the inner dress that hung loosely about her gaunt figure, her thin face showing lines of trouble, Luetta Smith was ushered into the presence of the Grand Jury yesterday morning. She went through the ordeal of answering questions for about an hour, and was then excused. Later she returned to the county hospital where she and her baby have been since District Attorney Lea ordered them taken there. Little by little she told again the story that has already been published this paper, amplifying the details. She told of her regard for Dr. Burke and her confidence in him, related his gifts of money, and his letters to her from time to time, and then told of his intimate relations and the birth of the baby of which she declared again he was the father. She was followed by Mrs. Macey of Laguna street, San Francisco, with whom she lived from June, 1908 to February, 1910, when she came to the Sanitarium where her baby was born. Mrs. Macey corroborated Miss Smith's testimony regarding the visits paid the latter by Dr. Burke at her home. ...Earl Edmunds and Miss Ada Clark, who were in the Sanitarium kitchen at the time of the explosion, described the startling incidents that followed, including the appearance of Dr. Burke and his alleged statements that Luetta Smith had carried out her previous threats to "blow herself up." Where is Lou Etta Smith? That is the problem District Attorney Clarence Lea, Sheriff Smith and the officers of the bay cities are trying to unravel. Lou Etta Smith is the woman whose tent house in the grounds of Burke's Sanitarium was dynamited last February, and the subsequent investigation of which led to the arrest and indictment of Dr. W. P. Burke. Since April 19 Miss Smith, who with her eleven-months-old baby went to the house of friends in Berkeley a few days following the finding of the indictment, has been missing, and although District Attorney Lea and the Sheriff have been investigating for about a week the matter was kept quiet until Wednesday. District Attorney Lea fears that Miss Smith may have been spirited away. He has information that certain overtures were made to her and while at present he will say nothing, the time may come when he will make public dates and the names of people implicated. At the time Miss Smith left Berkeley it was presumably for a visit to San Francisco. She left considerable of her belongings in Berkeley, and they are there at the present time, but presumably nothing has been heard of her. ...That some one furnished her coin there is no question for at the time she left the county hospital for the Files residence at Berkeley, and since, she was poverty stricken. District Attorney Issa and Assistant District Attorney G. W. Hoyle are apparently not much worried that Lou Smith's whereabouts will not be discovered. And Mr. Lea does not put much stock in the report that she is within a hundred miles of San Francisco, either. Yesterday pretty Mrs. Marian Derrig, blue-eyed and blonde, was mentioned in connection with the disappearance of Lou Smith and as one in whom Miss Smith had confidence. Mrs. Derrig is said to be a personal friend of Dr. Burke, and at the time of the sensational stages of the proceedings, she was mentioned as possibly an important witness. Mrs. Derrig is said to have visited Lou Smith in Berkeley and to have promised her money. San Francisco June 25--On the arrival today from the far east it was learned definitely, according to those on board of the vessel, that Miss Lou Etta Smith left here on the vessel when she departed on her last trip out, traveling as Lou Ella Baum. The woman kept to herself, and it was not until after she and her child had gone ashore in Japan that her identity was discovered. Sheriff J. K. Smith of Sonoma County was here today when the vessel arrived, and immediately boarded her to interview the Stewardess. The latter identified the picture the Sheriff had as the woman who had been on the vessel on the outward trip as Lou Ella Baum. The woman claimed to have relatives who were missionaries in Japan, and was en route for a visit with them. After securing a confirmation of the information held by the local authorities that Miss Lou Etta Smith, wanted here as the principal witness in the case against Dr. Willard P. Burke, had gone to Japan a cable has been sent the authorities at Yokohama to arrest and hold the woman as she was wanted here on a charge of perjury. The announcement of this fact by [Sonoma County Sheriff] Smith yesterday prior to his departure to Los Angeles came as a surprise. Sheriff Smith said that under the law a fugitive witness could not be brought back from a foreign country, but a criminal could. He also stated that a warrant had been secured for the arrest of the woman on a charge of perjury, and that District Attorney Lea had instructed him to cable for her arrest which he had done, and was now awaiting a reply. If the arrest is made the extradition will have to be handled through the action of the State Department at Washington with the government at Tokio [sic]. In this way the case will come to be known as an international one.